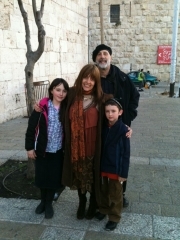 Robin’s Blog: Greetings from Israel! The premiere tonight at the Jerusalem Jewish film Festival was spectacular, BH! I want to thank you all for the tremendous support you have given us throughout the years. Wow! The film is really melting divisiveness and bringing Jews from disparate points of view together. People also came tonight from the Religious Film Festival in Rome (not Jewish)– they would like the film to play there as well. My heart is certainly singing!